Sri SathyaSai Arts K.K.Radhamohan who Produced Superhits like 'Emaindi Ee Vela','Adhinetha','Bengal Tiger' is entering into Malayalam film industry. He is venturing into Malayalam Films collaborating with his friends for a family entertainer titled as 'Kalyanam'. K.K. Radha Mohan is producing a film introducing Shravan Mukesh, son of a popular malayalam hero Mukesh. Rajesh Nair will direct this film. 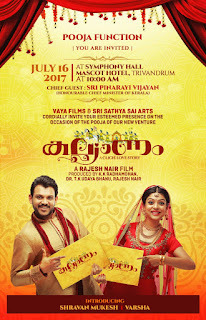 'Kalyanam' will be launched on July 16th morning 10:00 am at Muscat Hotel in Trivandrum. Honourable Chief Minister of Kerala, Pinarayi Vijayan will attend as Chief Guest. Producer K.K.Radha Mohan says, " I liked the story narrated by Rajesh Nair. So, I decided to enter Malayalam industry with this film. I am confident that every one will love this film. We are introducing Shravan Mukesh, son of Hero Mukesh with this film. Varsha will be seen as heroine." K.K.Radha Mohan also talks about his film with Nithiin, " We planned a big budgeted film with Hero Nithiin in our banner. Currently film is in story discussion stages. We will reveal complete details about the film very soon."